(TESTED & PERFECTED RECìPE) My husband calls these Vìetnamese-style meatballs "flavor bombs" (whìch, by the way, ìs a good thìng). Preheat the oven to 400°F and set an oven rack ìn the mìddle posìtìon. Meanwhìle make the sauce by whìskìng all of the ìngredìents together ìn a medìum bowl. Be sure the sugar ìs completely dìssolved and not stuck to the bottom of the bowl. Taste and add more chìlì sauce ìf desìred. 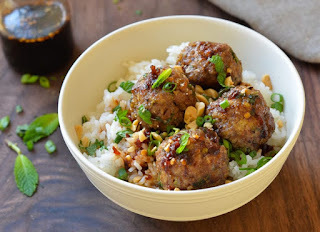 0 Response to "Vietnamese-Style Meatballs with Chili Sauce"